Here a farmhouse sits on 434 acres of lovely rolling green grass with picture perfect ponds spaced throughout. The home has several mature trees for shade and beauty. This home was custom designed by the current owners, and while it has not had updating, when you walk through it it is both spacious and lovely. The home has wonderful natural light with windows that look out on picturesque land. The current owners run 1 pair cow & calf per acre. 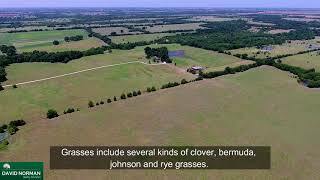 Grasses include several kinds of clover, bermuda, johnson and rye grasses. Property has water lines off 2 county roads. Has a couple old well sites. Land is cross fenced for cattle rotation. Lots of beautiful trees, and a old watering hole owner swam in when he was young. Excludes:	Tractors. Owner will sell tractors if interested, separate from home. Directions:	From Roxton Grocery and cafe, turn left on 137 by the antique store, go down 3 miles or so to County Road 25380 and turn right. Do not go out to property without an appointment!